I had a moment of inspiration out on my long ride yesterday. Following further discussion of what’s required to go sub 10 at Ironman I was considering issues of pacing. What are the paces needed to manage sub 10 and how they relate to training paces. The apparent disconnect between pace during training and those achieved during racing fascinates me. There’s always a little bit more in the tank on race day. Is this really true though? I realised I had partial data for the 2007 season when I went sub 10 at Ironman Austria. My bike had an Ergomo so I routinely trained and raced with power. I kept paper records of swim and run training and events throughout the year too. Taking this data I can look at pace and power and perhaps learn more about how I trained for the sub 10 result. The BIG caveat is this doesn’t tell you how to train for a sub 10 Ironman. It tells you what worked for me in 2007, but without appreciating what happened in 2006 or the exact weekly training structure it’s hard to apply to yourself. It gives guidance and hopefully more to consider if you’re aiming at the sub 10 goal. If you’re planning a sub 10 Ironman you need to break down the times required. Exact numbers will vary depending on personal strengths and weaknesses; I’ll work off the times I’d consider as an example. Firstly put aside ten minutes to cover transitions and for a small buffer. From there I’d aim at a 1:00 swim, 5:25 bike and a 3:20 marathon to comfortably come under ten. I think that’s reasonably balanced, you might need to adjust times to favour different disciplines. Knowing these estimates enables you to determine pacing for each stage of the race. It’s theoretical of course, but you can take this to your training and use as a metric for testing and performance. If you can’t ride the pace in an Olympic or Half Ironman then you know that it’s not going to work for an Ironman. On a more positive note perhaps you’ll find the required pace easy – that’s exactly where you want it to be. For my hypothetical sub 10 Ironman I want a one hour swim. That gives a pace of just under 1:35 per 100m so I need to be able to swim 1:34s, but more importantly I need to hold that over distance. Wetsuits and the draft complicates matters as they’ll normally give you a faster swim so perhaps you could get away with holding 1:38. For recent races I’ve liked tests of ten to twenty 100s on short rest to see if I’m comfortable below 1:35. In 2007 I was actively involved with my local Masters squad and went to some meets. This gives some long course race data for the early part of the season. My 1500m time suggests that I might be around one hour for the swim with the benefits of a wetsuit and draft (but not without). Clearly I had a disastrous time at the open water swim event close to Austria itself. I was a long way off pace and would have eaten into the buffer for my Ironman. I strongly believe that whilst the Austria swim felt relaxed and I was very lucky. The time was the result of some excellent drafting occurring by chance. With a large field the potential for drafting is huge, but requires good positioning at the swim start. There was nothing strategic about my first Ironman swim though! I happened to start centrally and up the front of the faster swim group and from there got carried along. Hypothetically I want a 5:25 or an average speed of 33.2km/hour (doesn’t seem fast when you type it). Speed and pace on the bike is heavily course and condition dependent though. 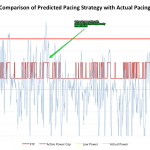 I’ve worked with power as my primary means of pacing since late 2006 and used heart rate as a fall back. Ironman is about being as fast and efficient as you can within conservative intensity zones. For sub 10 we’re looking at achieving that speed at a low level of exertion. One of the surprises of looking back at this data was how low the power was for the Ironman! I weighed about 71kg on race day so less than 2.5W/kg averaged (for reference I’ve averaged 3.2W/kg these days). Taking the sample threshold sets to indicate my FTP was around 255W at the time (sorry data is sketchy back then) I rode Austria at around 65% effort. If anything I was potentially under-performing. That 65% effort level is the key – at that intensity if I got my nutrition right I’m setting myself up for a good run. I currently race at a higher intensity than that, but I was new to the game then and if your main goal going under ten hours there’s something to be said for holding to that. I was interested to note that some of my long rides were very comparable to the Ironman effort. This isn’t typical of my training now where the trend I see is normalised power from long training rides as a good indicator of Ironman performance (assuming I’m well rested and putting in some effort on the day). The important metric is the capacity to perform at the 65-70% effort level whether based off heart rate, power or feel. Other races or some testing training sessions to trial paces in this area are definitely worth using. Outside of this the other focus has to be nailing your nutrition at that work level. For my 3:20 marathon I’m looking to be running 4:44 min/km (7:37 min/miles) not fast by running standards. The main factor in developing this is running lots. You need good aerobic endurance and conditioning for the Ironman run long before considering speedwork. I’m aware of arguments favouring speedwork for run economy and efficiency I’d point to how poor this is for most of the field anyway! The problem for most athletes isn’t just about run economy it’s a matter of having the conditioning to maintain good form late in the race. You may improve form on the track, but you only achieve the fitness to sustain it in an Ironman through aerobic conditioning. If you really feel the need to work on economy and speed I’d have to advise a dedicated run focus for a while. 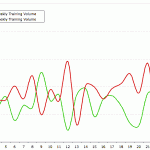 The impact of hard run sessions on training is potentially too high for their return. Frequent running isn’t so tough on the body and as conditioning improves you can increase duration and add hills to progress further. Unfortunately I have less metrics for running. I’ve data logged digitally, though plenty on paper. I work off pace and feel these days so heart rate doesn’t mean much to me, but it would have been useful. I didn’t have the run I wanted in Austria thanks to a classic combination of pacing and nutritional errors. I didn’t eat enough on the bike or early in the run and set out at three hour marathon shape when I was no where near that fitness. My training diary notes I slowed after 10km, but at 30km the wheels came off with stomach issues and loss of energy. The final 10km were a painful mix of run and walk that cost a lot of time. In training my long runs were roughly at the Ironman pace I would have wanted (though this wasn’t planned) I was generally running easy at 3:20 marathon pace. What you do in your regular long run is a good indicator of how you can perform in an Ironman marathon. Though these days my long runs tend to be slower than my Ironman pace – I still run at a similar pace to 2007, but I race faster when in form. Run race and duathlon results give some indication of the run conditioning I’d carried through into my tri career. I wasn’t doing speedwork in 2007, but I was still able to run a lot faster when I raced. Perhaps the fact I had a hard run race or event at least once a month substituted for track sessions. I’d carried through a lot of economy and form from my years of run training (when I had done speedwork). Either way speedwork wasn’t necessary to run a 4:53 min/km paced marathon. Whilst comparing my training data to the race it’s worth bearing in mind that I wasn’t targeting sub 10. It was my first Ironman so I just wanted to finish (and get a decent time of course!) The idea of sub 10 occurred during the bike and transformed to sub 9:30 for a while on the run. That soon disappeared though when nutrition and pacing reared their heads! I may have some records on that which I’ll have to dig out too. Whilst this is a little rushed and doesn’t give all the data it could I hope it gives some insight into the kind of training that lead to a sub 10 Ironman first time round. Feel free to ask any questions you have below.